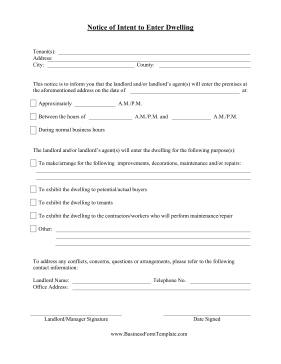 Managers, landlords and contract workers who need to enter a rental unit, apartment or rental unit are required to post a notice of intent to enter the dwelling 12 to 24 hours beforehand. This free printable provides a quick and easy template for posting on doors. It lists the tenant's information and provides the time of and reason for the entrance. Between the hours of _____ A.M./P.M. and _____ A.M./P.M.